OK, so we’ve covered the 2009 edition of the Sooners from head to toe, and Homerism has given them a clean bill of health. Honestly, I can’t find a thing wrong with this team. So sign the papers, punch the ticket to Pasadena, right? As much as Homerism wants to, for some reason I just can’t bring myself to certify the Sooners as a legitimate national championship contender. Why? I’m not entirely sure. Maybe it has something to do with depth issues. Maybe it’s the lack of an offensive playmaker. Maybe it’s all the new faces on the o-line. I suspect, though, that it’s Sooner Magic—or a lack thereof—that’s holding me back. In the ‘90s, even OU fans like me who grew up watching Barry Switzer’s squads hang half-a-hundred on overmatched Big 8 opponents had forgotten what success felt like. After such a sustained run of excellence, watching the Sooners stumble their way through an entire decade of something somewhere in between futility and calamity was downright tragic. When head coach Bob Stoops arrived on the scene in Norman in 1999, the fact he was able to get OU bowl eligible seemed miraculous; bringing home a national championship the next year actually was. Stoops quickly earned a reputation as a brash riverboat gambler whose teams played loose and were just as willing as their coach to dare to be great. The Sooners took chances that always paid off. Sooner Magic was back. OU football was fun again. Of course, with all the excitement surrounding OU’s resurgence under Stoops, Oklahoma fans forgot the decidedly less fun part of success: expectations. Suddenly, after an era in which falling to teams like San Diego State and Northwestern had become all too commonplace, losses to some of the best teams in the country turned into disasters once again. Undefeated seasons and national championships were the new standards. Gradually, that old Sooner Magic started to fade. OU kept on winning, but at some point it started to seem more like not losing. Were the Sooners playing tight? A 7-6 record in games decided by 10 points or less since 2006 is one way to answer that question. As fans, we don’t really get to see all the behind-the-scenes moments—practices, sideline skull sessions, team meetings—that really tell us about the mood of a team. Occasionally players may pop off to the press, but for the most part, they’re as well-trained in coachspeak as coaches themselves. All we have to go on is what we see on game day. Watching the Sooners lately, it’s easy to wonder if they’re actually enjoying themselves. And that starts at the top. From his demeanor on the sidelines to the exercise in antipathy known as a Bob Stoops press conference, OU’s head coach doesn’t look like he’s having any fun. Stoops doesn’t get paid to make people laugh, and football teams need lofty goals if they want to succeed. But maintaining high standards while preventing expectations from weighing a team down is a key part of the job description for an elite college football coach. Pro athletes may be able to handle the psychology of the spotlight on their own, but 18-year-old kids take their cues from their coach. Even though Florida beat OU in last season’s national championship game, those looked like two pretty evenly matched teams. The Gators pulled it out through sheer will and being that much more aggressive when it mattered. This season, Florida brings back plenty of firepower. Man for man, though, OU is equally strong. 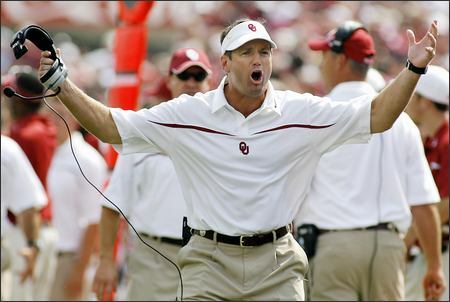 Yet, if the Sooners want to get back to the top of the college football mountain, they need to get the Magic back. Here’s hoping Stoops brings back some of his old tricks.